Ready for more tech giveaways? Then you've come to the right place. In partnership with Rosewill and VIP Computers, HEXUS is giving you the chance to win one of two PC upgrade bundles. Each goodie bag will include a B2-Spirit full-tower gaming case, a Capstone 1000W modular power supply, an RDCR-11004 5.25in data hub and a Jet RGM-300 gaming mouse! We have two bundles up for grabs, so what are you waiting for? Answer the following simple question to enter our prize draw, and don't forget, you can also claim a free second entry via Facebook to increase your chances! The competition winner will be picked at random from all eligible entries that arrive by 22:00 GMT of the closing date, July 20, 2016. The winners will be notified via email by July 27, 2016. The winner must claim their prize within 7 days of the promoter sending notification. If the prize is unclaimed after this time, HEXUS reserves the right to offer the unclaimed prize to a substitute winner selected in accordance with these rules. 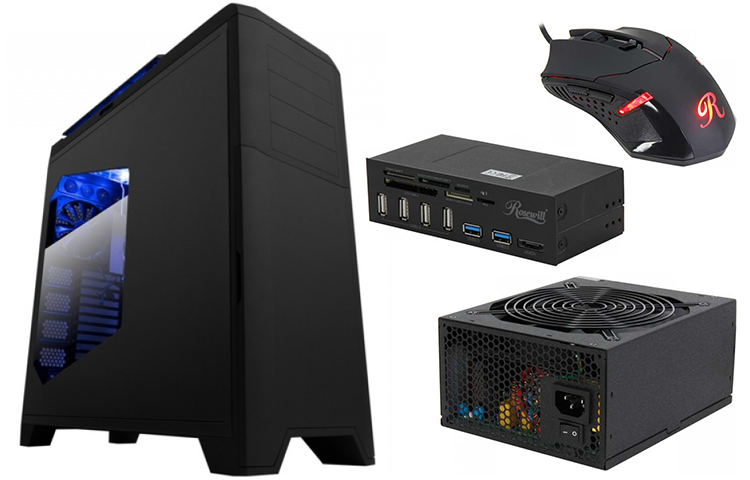 The prize is one of two Rosewill PC upgrade bundles including a B2-Spirit full-tower gaming case, a Capstone 1000W modular power supply, an RDCR-11004 5.25in data hub and a Jet RGM-300 gaming mouse. Thanks Hexus. I can't seem to get to the Facebook comp. entry page though - link just takes you to the main Hexus FB page. dannyboy, give it a go now. Nice. Many thanks to Hexus and Rosewill.